Synopsis: This is a biography of sorts although it focuses as much on what we don’t know as what we do. 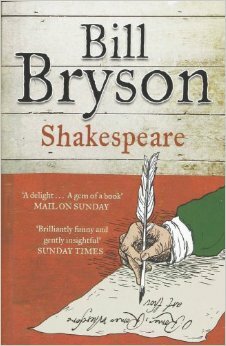 Written in Bryson’s inimitable style, it is funny, informative and clever. A must read for anyone with a passing interest in Shakespeare. I’ve been meaning to read this for a while. There were a couple of reasons for this. I’ve read a lot of Bryson’s work – including Mother Tongue and A Short History of Nearly Everything as well as some of the travel writing so I knew that it would be readable and informative. And I was interested in the life of Shakespeare. I expected that we would know about him. I’m not sure why that was. It makes sense that we would not know much about him. So unlike conventional biographies, this is not a simple run from birth through life to death. It explores what we know about each area of Shakespeare’s life, attempts to discuss any mysteries or controversies and explains why we don’t know more. It’s fascinating really, that Shakespeare should still mean so much to our culture and yet we can barely verify what he looked like or what he did for large periods of time. We can place him at a specific time and place only rarely. We can barely prove that he wrote the plays that take his name and that has led to a whole other academic avenue. The ‘who was Shakespeare really’ brigade. Bryson makes short shrift of their theories. They all seem to be fabulously eccentric and it is almost a shame to have to tear their wonderfully hopeful theories apart. Bryson does this in style and this was one of my favourite parts of the book. It is almost inevitable, given the darkness that surrounds most of Shakespeare’s life that there would be those who would like to join the dots. Unfortunately, they very rarely come anywhere close to the real picture. Bryson’s curiosity cannot be faulted and as with all his works, his enthusiasm comes across clearly and the book is a pleasure to read. In fact, at the end, I wished there was more to say. I was very sad to put it down.